Re-imagining one of William Mitchell's flawless 1965 Cadillacs. Caddy built short-deck 6-window hardtop sedans in 1961, and 4-window short-decks in 62 and '63. They produced full-size 6-window sedans all the way through '64. Though they dropped the short-deck for '64, my chop presumes they decided to try again in '65 with the '61 formula—short-deck, 6-window—though pillared this time. Click on image to enlarge, as always. C H O P S — Oftentimes, to relax, I'll peruse eBay's cars for sale. I'll pick a "marque of the night," say Mercury, or Hudson, or Nash, and then go through the years and see what is still out there. Tonight I picked Cadillac—1961-72. I was struck how many 6-window sedans Cadillac showed up. They were very light-looking, almost sporty rooflines for such a stately luxury car. I found examples of them for sale right up through 1964, the last year for the bodystyle. 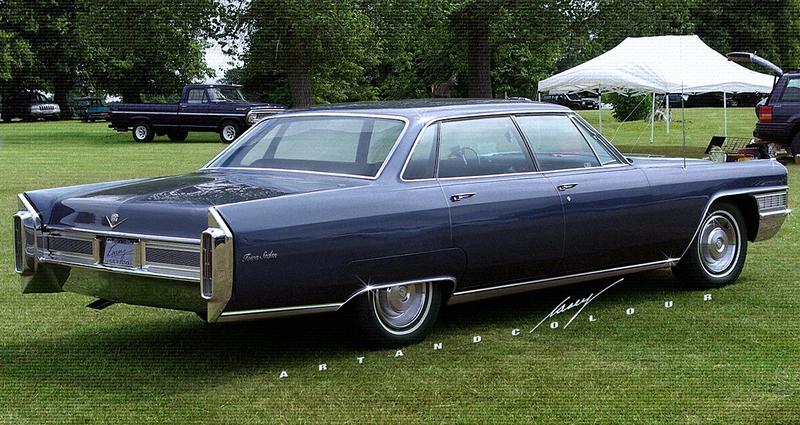 It got me thinking of what a 6-window 1965 Cadillac might have looked like. The birth of a chop idea! I found a good image of an appropriate car, a mint condition low-line '65 Calais pillared sedan, with the proper focus and resolution, thanks to Google Images. My "vision" wasn't quite as easy as just adding the C pillar window, though. Besides adding the extra glass, I ended up lowering the roofline, changing the angle of the C pillar and enlarging the rear window, all in order to get the same "sporty" feeling as those earlier 6-window Caddys. I liked how it looked at that point, but decided to "step it up a notch" and recreate a little-known version of the Caddy sedan offered in the early '60s. the short-deck. From 1961 through '63 Cadillac offered a version of their sedan with a six-inch shorter trunk for customers with pre-war garages which tended to be smaller than postwar garages. Offered at first in their base Series 62, as a 6-window, for '62 and '63 it was offered only as a 4-window, though a De Ville-level model was added. The base short-deck for '62 was named the Town Sedan and the step-up version, the Park Avenue. For '63, only the Park Avenue was offered. Since I had started out with the low-line '65 Calais, I named this chop the Town Sedan. Besides shortening the trunk, I reshuffled the chrome trim, taking off the mid-body chrome spear and adding chrome rocker panel moldings to further differentiate this shorter sedan from its longer kin. In the end, I liked the way it came out, but in no way do I think it's "better" than the cars Mitchell approved. 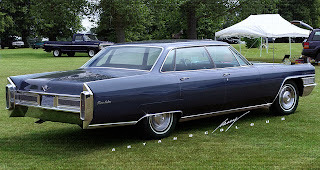 The 1965 full sized cars he presented to the world, from Chevy through Pontiac, Oldsmobile, Buick and Cadillac, are all examples of a design manager at the very tippy top of his game. There isn't a bad line on any one of them, and they've all more than withstood the test of time. I photographed a derelict '62 Park Avenue more than 20 years ago. For my blog post, click here. 1961 Cadillac DeVille info here. 1962 Cadillac DeVille info here. 1963 Cadillac DeVille info here. A reader, Bobf, mentioned he'd like to see an early '60s Caddy with a fastback roof similar to the '67 and '68 GM full sized coupes. I've thought about a car like that for a while, too. It's difficult to find decent high-resolution photos of older cars, though. 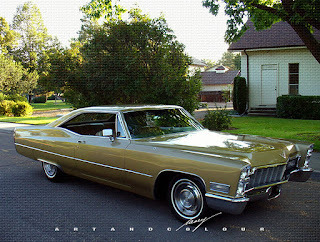 I've been checking out '68 Cadillacs on eBay and Hemming's lately, and had in my files this medium-resolution photo of a gold Coupe de Ville. I'm particularly partial to '68s as my father gave me a '68 Hardtop Sedan de Ville for my 20th birthday back in 1977. I loved that car and kept it for about 10 years. I spent about 10 minutes this morning mocking up a fastback '68 Coupe de Ville to see how it would work, and I love the results. 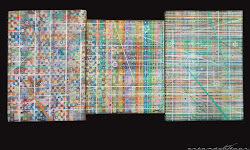 I'll keep looking for a high-resolution photo to start with, and create a real chop one of these days. This car looks like such a natural, it's too bad Caddy didn't offer it in addition to their much more formal coupe. The '68 Buick LeSabre/Wildcat looked awesome with this roofline, especially with the optional fender skirts. Update: As one of my loyal readers, PaulNYC, pointed out, this could logically have been a return of the "B Body" Cadillac, similar in marketing as the Series 61, discontinued in the early '50s. Perhaps the entry level Calais could have been differentiated more from the De Ville series this way. Both of these are terrific. For the 65, it's interesting that you don't really notice that the deck is shorter -- maybe a result of the lowered roofline. The trim is reminiscent of the Fleetwoods of the same year -- I've always liked the restrained trim on those Fleetwoods. Overall it think it looks "factory" -- great job. And the "10-minute chop" looks cool, too. I guess Cadillac was on a formal track by that time but they could have done something like that very easily -- a B body Cadillac -- the first since 1950. A four-door hardtop with the B roofline would be cool too. As to your comment that the six window sedans were light and sporty, I agree that they are very light looking but I never thought of them as sporty -- I saw them more as formal. Well, that's what makes horse-racing, as they say (I never really knew what that was supposed to mean!). A true B-body Caddy could have been the Calais, which would have made more sense. As it was, Caddy had to really scrimp on the interior of the De Villes to get the Calais price point down enough. It's almost Chevy like when you see them. Perhaps a slightly shorter B-body Calais would have been more inexpensive to build and not really lose too much room or status, while giving them a bit more money to spend on fabrics... More chops in the future! OMG! you have out did yourself again! My boyhood next door neighbor had a 65 Sedan Deville Light blue Metallic with a white top. Simply beautiful The white roof helped it look less heavy. I love the 6 window treatment and shorter rear deck on the first chop. The second chop with the fast back roof line is another win. That really re-emphasizes the angularity of the original design elements. It looks like it should have already happened. Simply brilliant! Great point about the Calais -- the last B body Cadillac was the 50 series 61 and that was not quite as sparse inside as the Calais -- I think it came standard with an all-vinyl interior and carnk windows -- not exactly what a Cadillac customer was used to. I'm sure very few were sold in basic form -- and by the time you paid for things you needed, you might as well have bought a deVille. Thanks, C-n-T! I can't wait to explore the fastback Caddy in better detail when I find a better donor shot. I think I'll make it the B-body as Paul mentioned. Paul, I've found some Calais for sale on eBay and their interiors were definitely cut-rate. Perhaps the cloth would have been OK, but the vinyl looked like it was from a taxi, and the crank windows and seats would have bothered me in a Cadillac! And you're so right about the options. Once you added in power windows, seat and say an AM.FM stereo radio, you could have had a De Ville with those items standard (well not the AM/FM back then). The search is on for high-resolution photos in focus, too! Thanks, Casey. This is great. I thought the combination of fastback and fins would look terrific and I appreciate the results. I do prefer the upper and lower fins of the '61 though. I have to learn how to do this. Thanks, again. thanks. I use Photoshop CS4 although I hope to get 5.5 soon, unless I wati for the inevitable 6.0 If I get 5.5 it's guaranteed that 6 will come out the next week, lol. I'm sure you can find tutorials online to learn how to use the program. I've been working i Photoshop for about 17 years, and still learn something new most of the time I use it! I found your blog via a post on Hemmings blog, it's very nice :-) It's an interesting "what if?". Speaking of some "what if? ", I spotted a site called "What if cars?" who imagined some interesting "what if?" like what if there was a 1961 Edsel Corsair. That site inspired me a bit and I did some sketches of some "what if?" then I posted on Deviantart like this 1970 DeSoto, 1966 2-door Ford Falcon wagon. Hi Stéphane! Thanks for stopping by. Your drawings are very creative. I really appreciate someone that would wonder what a 1970 De Soto would look like! The Falcon 2 door wagon is a smart idea too. I've seen that other site you mention before. That guy is very creative too. At first I read your post as a 1961 Edsel Corvair, which I thought would have to be VERY creative, lol. His Corsair though, is really nice. It's really too bad FoMoCo pulled the plug so early with the Edsel. I hope you check out my site in the future, too. Congratulations on the Hemmings posting. I have some ideas for other combinations: This '56 convertible in a beautiful pistachio green paired up with a Nomad roofline for an earlier version of the Ratpack car. Maybe this was the Palm Springs car. Just a suggestion. Just read the oak tree essay from Hemmings that you included - great stuff. Your photos are very nice too. Wow! I came over here from the Hemmings blog after seeing the lovely '68 fastback coupe. I've always liked the '67-'68 coupes anyway, but GM missed the boat on this one! wow, Bob, those are top-dollar cars!!! The idea is great. Will add it to the list! Thanks for stopping by, Dan. Hope you check the blog out again! With a beautiful '66 Cadillac as the base car. Thanks. I'll try to leave you alone for a while. My parents always owned Cadillacs. My mother drove a '61 Esprit de Ville wagon. She used it to get groceries and go to the country club for her Thursday golf league. We also went on vacations in the wagon. And then my father bought a gold '68 Calais. All the two-doors were hard to get into and out of, progressively so as we grew. But that was the price of riding in two cool Cadillacs. Both of those chops are great. I'm a huge fan of 65 Cadillacs, in fact I think it's their best design. Another cool style that did not come to life was in 1966 when they made a Halo roof version, concept looked great. Bulldozer: your site is really fascinating. I sent you an "ask" message, I didn't see a way to comment otherwise. Thanks for stopping by and leaving your links! I wanted to wish you and the folks you care about a happy Thanksgiving. Thank you Bob! that's very kind. The same to you and yours! Thanksgiving is the only holiday I really enjoy, lol. I love cooking everything I remember from Thanksgivings of my youth. Christmas/New Years/Easter/ etc I don't really celebrate, but turkey day is the best! as a 5 seater El Camino? Thanks for your comment and for checking out my site. The car you propose would sort of be an early Escalade 4-door pickup—I forget the name of it. I'll add it to my list! It's a pretty long list, but I'll try to get to it sooner rather than later. happy new year! A little late to the party but....I dig it. Would look good without the fender skirts too! Almost like a Caprice with the Caddy front/rear end. I own a 1968 Coupe deVille that I'm currently fixing all the rust on. Always looking for ideas for custom mods when I'm ready for that stage. Not sure how I didn't see this post before! Great idea, and great execution on the pic. Cheers. 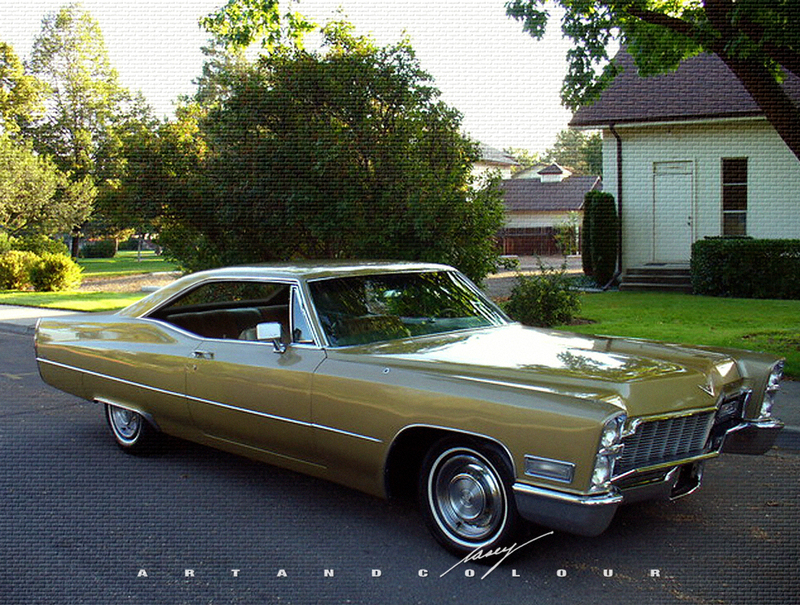 Good luck with your '68 Coupe de Ville! 1968 is one of my favorite years for older, yet daily-driveable, Cadillacs. Casey, try www.autowp.ru website for good wallpaper-size pics of older cars. They add hundreds of new pics daily and many of the new additions are of pre-1970 American cars. wow awesome job! this just popped up on my google images and i thought it was real. I have a 67 and i think the reason they had skirts on these cars is to make it look more proportionate. I think it looks to big in the rear now, but if you cut out the skirts i think it would flow better. All your designs seem to hit a sweet spot in me. I actually had the '67 Fleetwood in Gold. And this rendition is really making my morning start well. Glad I found your site. Hi Ray. Sorry for the delay in responding. Thanks so much for stopping by! I liked the 1967 and 1968 GM 2dr. fastback hardtops, especially the Buicks. Too bad Cadillac didn't offer a fastback 2dr. hardtop at the time. They could have had it with the milder "Coke bottle" styling and it might have sold well. Hi Jeff! thanks for the comment and for stopping by. I hope you keep checking out my fake cars! Maybe there will be a 1968 Cadillac fastback 2dr. hardtop. I happen to like the idea of such a car. I certain remember the GM fastback 2dr. hardtops in their heyday.